Seoul's global reputation centers on its rapid pace, technological prowess and glittering skyscrapers. But wander its streets and there's a whole other world waiting to be discovered -- one of history, culture and art. Still surrounded by its ancient city walls, which can be easily hiked, Seoul is home to five palaces, all well worth exploring, although Gyeongbokgung and Changdeokgung are the real standouts. For those keen to steep themselves in modern Korea, Seoul's legendary and often overwhelming nightlife is the place to start, especially around Gangnam. Clubs attract the best DJs in the world and there's always karaoke for partygoers keen on something a bit more intimate. It’s the most happening of cities, a place where over 200 languages are spoken and millions flock each year to see its world-famous sights. New York draws visitors in like nowhere else. The crowded streets of Manhattan are the stuff of legend. 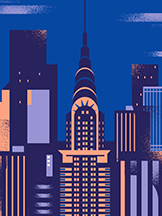 First timers will want to head to the top of the Empire State Building and stand beneath the glare of the lights of Times Square. But there’s so much more to see and do, whether it’s catching an Off-Broadway play, checking out world class art at MoMA or shopping the streets of SoHo. Brooklyn’s hip neighborhoods of Greenpoint and Fort Greene offer a more relaxed vibe, while the food in Queens’ Chinatown is worth the long subway ride.